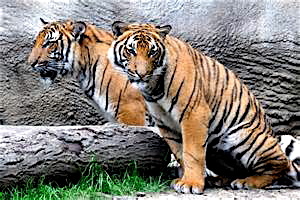 Malayan Tigers at the Cincinnati Zoo. 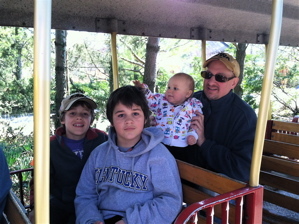 Coming into the third week of a three-week spring break, the boys and I, and the baby, needed some fresh air. The weather hadn’t been the most cooperative, as temps remained chilly and didn’t inspire much outdoor activity. The first week had been fine, as Gabriel, 10, and Jacy, 8, both blew down from all the school stress and were content to remain in pajamas all day and play Minecraft. Previously they were relegated to playing the free version that came on Maia’s iPhone, but Gabe had received the full version as a birthday present a couple weeks back, so both boys were enjoying the advanced features they could utilize on Maia’s computer. Left to their own demise, they would happily sit around all day and night building block cities and fighting creepers. They also shared a Nook device, so one could watch YouTube videos on Minecraft as the other played. This was helpful as we got into the second week of spring break, because each started picking on the other. By the third week they had thoroughly mutated their sleeping schedules, staying up till 4:00 AM gaming and sleeping till noon. It’s good stuff no doubt, but we all had cabin fever, and the boys (or smelly toads as I refer to them), were waking up daily ready to agitate each other. 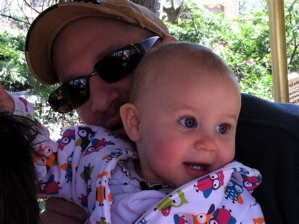 Waffles and dad at the zoo. Meanwhile Waffles (Isabella), who wasn’t yet 1-year old, and I, were doing our thing – but for me it was near impossible to write or research much with three kids running amok. I might as well get outside. So on Tuesday of the third week we loaded up the car, Maia took a personal day, and the five of us headed 90-miles north to the Cincinnati Zoo. We hoped to arrive earlier, but why rush. We still had three hours, which was fine. The Cincinnati Zoo and Botanical Garden is one of the oldest zoos in the United States, dating to 1875, with its Reptile House being the oldest zoo building in America. This was really the first decent day in three weeks; still chilly, but easily jacket weather. Since time was an issue, we headed straight for the train ride. It’s a mini-choo choo kind of deal, and was Isabella’s first voyage on the rails. She lit up as we hopped aboard. The ride isn’t that far. It takes you around the center of the park and over Swan Lake, but all the crossing gates closing and train whistles make it fun for kids. After disembarking, Maia and I pulled out the map and made a hasty plan. There was no way we would be able to see everything, so we needed to limit any unnecessary backtracking. The idea was to hit the three basics of lions, tigers and bears, of all varieties (snow leopards, polar bears, cheetahs and the like); then the water critters, like manatees; and the monkeys. Those were all must-sees. It was still early in the season so several animals were hanging inside instead of out in their natural habitats. 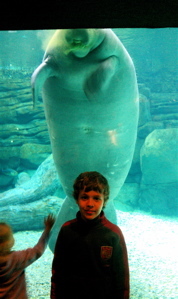 Jacy about to be consumed by a manatee. The polar bear was totally zonked, lying out in the sun absorbing some rays. I don’t think he was moving even for an earthquake. The white lions were regal and composed, taking in the scene and bothered by little. We dodged into Manatee Springs, which is a huge indoor aquarium where these ginormous creatures can be observed below the surface through glass as they eat and swim. Considering their size, they give off this utterly peaceful vibe, befitting the title of “sea cow.” Something about their forlorn look makes them disarming and huggable. They would literally pose with you, and appeared to be between 10-13 feet long. Very cool. There was Lemur Lookout and Gorilla World, Wings of Wonder and Night Hunters. We saw snakes and spiders, turtles and crocs. Cat Canyon was a big hit. 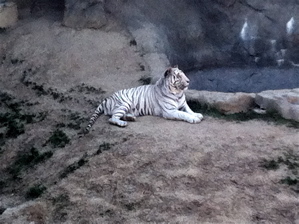 The cougar was menacing, the snow leopard was gorgeous and the white tigers appeared extremely bored. Pretty, but bored. I volunteered to throw Jacy in to see if he could make it to the other side before the tigers took notice. The biggest hit of the day was the penguins, partly because of movies like “Mr. Popper’s Penguins,” “Madagascar” and “March of the Penguins,” but also because they are such amusing and well-dressed creatures. The habitat in Cincinnati is partially above water and partially below, which Isabella loved. She could crawl up to the tank, and look in on the swooping penguins as they made their dives. She makes this growling noise these days when she’s really happy, and was doing a lot of that as she slapped the tank with her paw. We sprinted past a few more exhibits on our way out, but three hours went by rather fast. We saw our highlights, but totally missed the elephants and giraffes, OH MY! By the time we reached the car we had three tired critters. Waffles and the two toads peacefully loaded into the vehicle for the journey home. To top it off, we ventured over to Price Hill Chili for snacks afterwards. I had been trying to give this joint a try for years, and it was worth the wait, excellent chili and cheeseburgers! 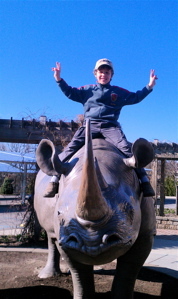 A trip to the zoo and top-flight junk food, now that was a field trip I could get behind. This entry was posted in Family, Food, Travel and tagged Cincinnati Zoo, Price Hill Chili. Bookmark the permalink.